The first mention of an auxiliary chapel in Moerkerke, dependend of the church of Oostkerke, takes us back to the year 1110. Fairly quickly Moerkerke became an independent parish (in 1190). The first real church was erected in the beginning of the 15th century; remarkable about this building was the centrally placed tower. Already in the middle of the 16th century, the construction was so ruinous that repairs were necessary. Many repairs and renovations later, this church was eventually torn down (at the end of the 19th century and replaced by the current one. 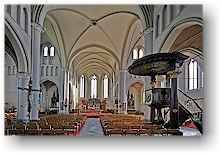 The new church was necessary because the population had risen so much that there was not enough space anymore for all the parishoners in the old one. Because of the ramshackle condition, it was not an option to extend the old church. 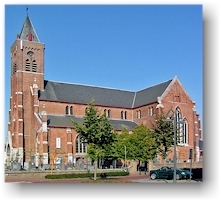 The new brick church has been built in neo-gothic style, a popular style at that time. Construction started in 1867 and was finished in 1869. The church was consacrated on 8 September 1870. A remarkable chararteristic of the church was the slim spiked tower. To prevent it that the tower would be used as an observation post by the allied forces, the tower was shot to pieces by the German defenders on 12 September 1944. The damage was repaired after the war but the original slim tower was not restored in its original form but replaced by the current, a little less elegant, specimen.